In one rural county, several individuals requested absentee ballots on behalf of hundreds of voters. What happened to those ballots? 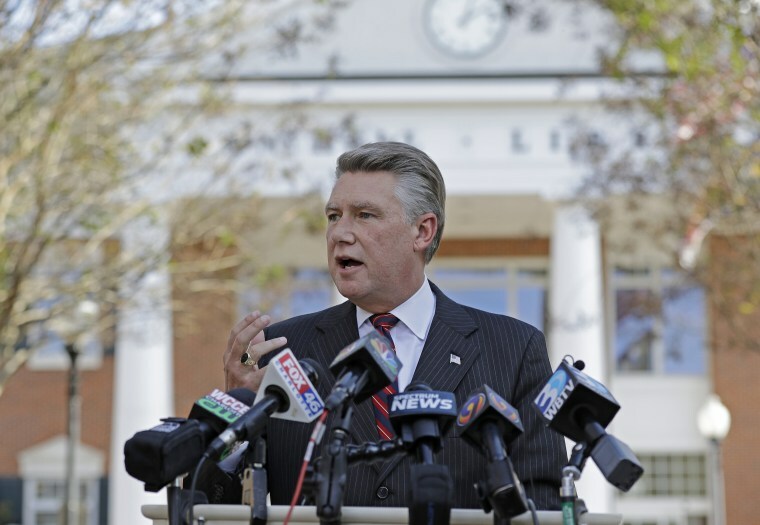 ELIZABETHTOWN, N.C. — Pressure is increasing on North Carolina to find a resolution to the unresolved congressional race in the state’s 9th District as allegations of election irregularities and fraudulent activities continue to surface. State investigators are combing through election board records in several counties to discover whether there was an organized effort to unlawfully collect the absentee ballots of thousands of voters and then not turn those ballots over to election authorities. They are especially interested in Bladen County, a rural, low-income area in the southeastern part of the state where investigators are looking at several individuals who turned in requests for absentee ballots on behalf of hundreds of voters. The results of the investigation could put in jeopardy Republican congressional candidate Mark Harris’ unofficial lead of 905 votes over Democrat Dan McCready. The Charlotte Observer’s editorial board Wednesday called for the state to hold a new election, while Rep. Gerry Connolly of Virginia, a top Democrat on the House Oversight Committee, said the committee should investigate. North Carolina GOP executive director Dallas Woodhouse said Thursday that the party supports the state investigation. "If they can show with certainty that the outcome could not have been changed, they need to certify Mr. Harris and continue to support all state and federal criminal investigations," he said. "If they can show a substantial likelihood it could have changed the race, then we fully would support a new election," Woodhouse added. Meanwhile, some voters in the district are now speaking out, with personal accounts about how their absentee ballots were unlawfully collected. Datesha Montgomery told NBC News that a blonde woman came to her door on Oct. 12 and asked if she could collect her absentee ballot. "I told her, ‘Sure.’ I had broke the seal in front of her to show it was never opened," Montgomery said. "I’m telling her who I was voting for, and she was like — she didn’t wanna hear it, so I just like, didn’t say nothing else. I just filled out two blocks, and I gave it to her." Montgomery, 27, lives with her 4-year old daughter in a neatly manicured public housing complex named Twisted Hickory just outside of Elizabethtown in Bladen County. She said she gave her unsealed absentee ballot to the woman, believing her to be an election official who would turn the ballot in. But she said two investigators later showed up at her house and told her it had never been submitted. So she went to a polling place on Election Day to cast her vote in person. Emma Shipman, 87, of Tar Heel, had a similar story. A blonde woman showed up at her door to encourage her to turn in her absentee ballot, she told NBC News. But Shipman said she wouldn’t give it to the woman, even after the woman said she would provide a stamp to mail the ballot for her. “I have plenty of stamps,” Shipman said she responded. Under North Carolina law, only the voter, a relative or a postal delivery person (U.S.P.S., UPS, or Fed Ex) can deliver an absentee ballot. Both Shipman and Montgomery said they had signed affidavits sent to the North Carolina State Board of Elections and Ethics Enforcement to be used as evidence in the board's ongoing investigation into fraudulent activity regarding mail-in absentee ballots in several counties, particularly Bladen, which has a population of 33,500. The board has not certified the election results in the race, and is now conducting an investigation. In a press release, the board stated that “in light of claims of numerous irregularities and concerted fraudulent activities related to absentee by-mail ballots and potentially other matters,” it will hold an “evidentiary hearing” on or before Dec. 21. The hearing will examine whether irregularities or fraudulent activities affected a “sufficient number of votes” to change or taint the results or outcome of the election, or cast doubt on its fairness. The board is looking into 14,056 absentee ballots requested for voters across the 9th District, according to Josh Lawson, the board’s general counsel. Of these, 10,651 were returned, and 3,405 were not. The board has concerns about whether irregularities and fraudulent activities could have affected ballots in both categories — ballots illegally completed or tampered with and counted, or ballots illegally discarded. Harris racked up a winning margin of 1,557 votes in Bladen County, and 61 percent of the absentee ballots were cast for him even though just 19 percent of those ballots were cast by registered Republicans. Both Shipman and Montgomery, who say they don’t know each other, identified the woman who came to collect their ballots as Lisa Britt. Britt has been connected in press reports to McCrae Dowless, a Bladen County water and soil commissioner. According to the board, allegations about Dowless’ operations and activities involving absentee ballots are now a focus of its investigation. According to state records, Dowless has a criminal background that includes a fraudulent insurance claim. Dowless was hired by the Harris campaign as well as other local campaigns, according to The Washington Post, to help in Bladen County. In an election-night speech at his headquarters, Harris thanked two counties — Bladen and Union — for putting him over the top. On Wednesday, the board announced that its newly appointed chairman, Joshua Malcolm, had written a letter directing staff to review and post documents relating to the investigation in an “online portal” for the public to see. One of the publicly released documents, an “office record” maintained by the Bladen County Board of Elections, shows that Dowless himself turned in 590 absentee ballot request forms between late August and early October. The same document showed that a Jessica Dowless, who was described by BuzzFeed News as a distant relative of Dowless, turned in 185, a total of 775 absentee ballot request forms between the two. Additional documents obtained by NBC News from an attorney working with Democrats to find information to pass on to state investigators indicate that Jessica Dowless and a half dozen others were signed witnesses to more than at least 150 absentee ballot applications. Other signatories to the applications include Sandra Dowless, Britt's mother. Cheryl Kinlaw and Ginger Eason also signed dozens of applications as witnesses. NBC News has tried to reach every signatory on the absentee ballot applications it received. Sandra Dowless said she "had nothing to say" and attempts to reach Jessica Dowless, McCrae Dowless, Lisa Britt and half a dozen others who signed absentee ballot applications obtained by NBC News via phone calls and knocking on their doors were unsuccessful. Kinlaw said she was paid $100 to collect absentee ballots. “I feel bad now that I know that it wasn't legal, but I didn't know at the time,” she told WSOC in Charlotte. Election fraud allegations in Bladen County have been around for at least two years, which is when the state board asked law enforcement to begin investigating. Another document released Wednesday by the State Board of Elections and Ethics Enforcement shows that it had begun acting on concerns about absentee ballots before Election Day. The document was a letter mailed to every voter requesting an absentee-by-mail ballot in Bladen County during the 2018 general election, warning that "only you or your near relative or legal guardian can mail or deliver your ballot to the elections office," and that "only you can vote your ballot." It was sent between Oct. 29 and Nov. 2. This all comes amid an ongoing political fight in North Carolina, where election fraud has become a wedge issue for voters and political parties. In 2013, the Republican legislature and the Republican governor at the time implemented a strict voter ID law to prevent voter fraud. After a federal court determined that the law was unconstitutional, a pared-down version was put to voters, who approved it in the last election. The minority leader in the U.S. Senate, Chuck Schumer, D-N.Y., implored Republicans to be concerned about the allegations in North Carolina in a tweet Thursday night, referring to Thomas Farr, the Raleigh-based attorney that all Democrats and two Republicans blocked from a district court judicial nomination because of his work defending the strict voter ID law. The Democratic Party has dispatched additional lawyers and staff on the ground to collect sworn affidavits of unlawful activity regarding their absentee ballots. The State Board of Elections and Ethics Enforcement is made up of nine members: four Democrats, four Republicans and one independent. Two of its Republican members voted in favor of the hearing — John Malachi Lewis, who has served as a deputy counsel for the North Carolina Republican Party, and Stacy Eggers IV. Two voted against — Ken Raymond, the board’s secretary, and John Randolph “Jay” Hemphill.